This comfortable studio apartment is located in the city centre on Opletalova street, right off Vaclavske Namesti (the Wenceslas Square). This is the part of the city called Nove Mesto (the New Town), founded by Charles the Fourth in 1348. So from here you have very easy access to all the shopping possibilities, the nice restaurants and bars and of course also all the exiting sights, Prague has to offer. There are 2 metro stations very close to the apartment - Muzeum and Mustek. From these two stations you have the choice between all three metro lines in Prague - so should you decide to take a tour to another part of the city, it really doesn't get any easier. 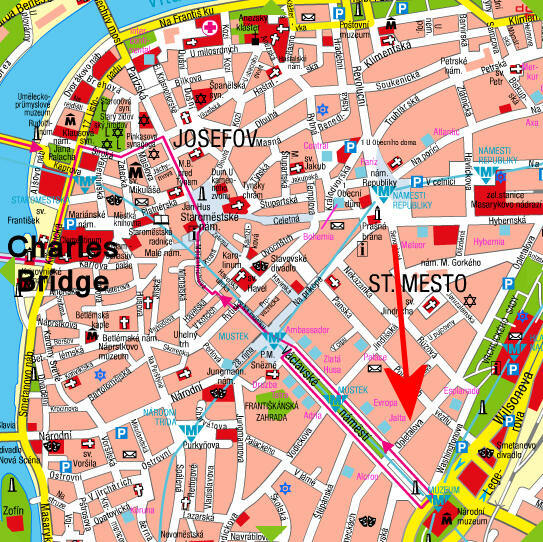 Furthermore, the apartment is close to Prague's main railway station (Praha Hlavni Nadrazi) which of course makes it very convenient, if you travel by train. The apartment is situated on the 3rd floor in a wellkept building, which has a lift. The windows are facing away from the street - so you have the comfort of a peaceful and quiet atmosphere. The accommodation consists of a roomy living area with a large double bed. 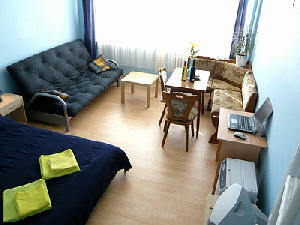 Furthermore there is a comfortable double sofabed which makes it possible for up to 4 persons to share the apartment. There is satellite TV and a dvd-player which of course also can be used as a cd-player. The apartment even has an internet connection and a computer, which is free of charge - or you can plug in your own laptop if you bring it. In the living room you'll also find a nice dining corner with comfortable furniture where you can enjoy a meal, work or simply just relax. The kitchennette has a double cooker, electric kettle, coffee maker, microwave oven and fridge with a small freezer. When you arrive you'll find some complimentary refreshments in the fridge, so you can relax and start planning your adventures in Prague. The bathroom is with WC and a nice bathtub - and of course a hairdryer. There is equipment for ironing, and the apartment also has aircondition. Stay more than 7 nights 20% discount.